An interesting aspect of science history is that you can see how theoretical ideas rise and fall based upon the evidence. 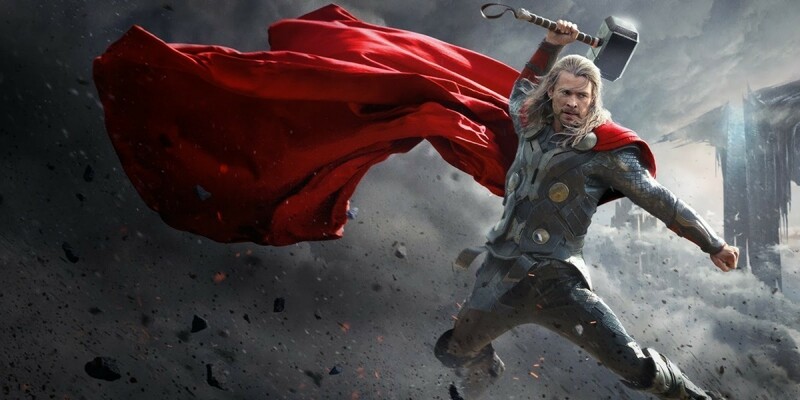 Models are proposed, experiments are made disproving them, and then the hammer falls. One such idea is that of the luminiferous Aether. The idea of an aether arose from the fact that light has properties of a wave. 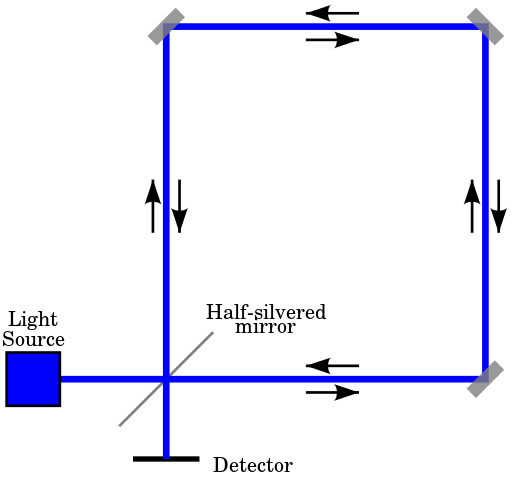 This was shown both theoretically through the unification of electricity and magnetism, and experimentally through the double slit experiment. By the time this was clearly known in the 1800s, it raised a very interesting question: if light is a wave, what does it propagate through? Waves on a pond, for example, propagate through the water. Sound waves propagate through the air. As far as anyone knew at the time, waves needed a material or medium through which they could travel. Surely there must be a medium for light, and this came to be known as the luminiferous aether (named after the “fifth element” of the ancient Greeks). If the aether actually existed, we should be able to see its effect. If light traveled through a medium, then its observed speed should depend on the speed of the aether relative to us. You can see how this would work with water waves. If you were to drop a stone into a still pond, the waves would spread out evenly in all directions. The speed of the ripples depends upon the water, which would be the inherent speed of the waves. Now suppose you dropped a stone into slowly flowing river. In this case the ripples would spread out as usual, but since the ripples also flow with the river, the ripples in the downstream direction would appear to move more quickly than the ripples in the upstream direction. In the late 1800s Albert Michelson and Edward Morley performed an experiment hoping to measure the aether. They devised an experiment that would measure the speed of light in different directions. 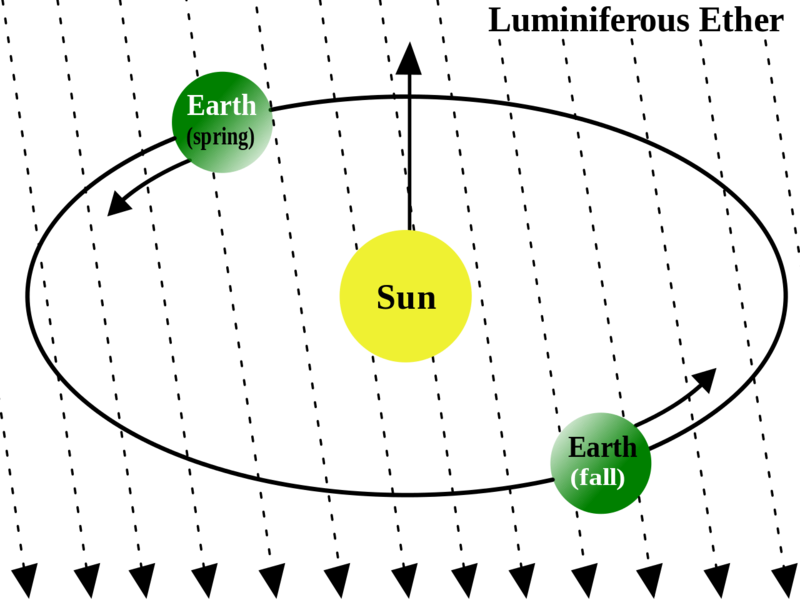 The idea was that since the Earth orbits the Sun, it must be moving relative to this aether, just as we can move through the air. That would mean the speed of light measured in the direction of Earth’s orbit would be a bit slower than expected. In the opposite direction it would be a bit faster. Measuring the speed of light is hard, so Michelson and Morley used a clever trick that just measured the shift in light speed, but the end result is the same. Much to their surprise they found no observed shift in the speed of light. The solution to this mystery was eventually found in Einstein’s theory of special relativity, which said there was no aether. Instead light had an absolute speed in all reference frames. While the Michelson-Morley experiment is typically taken as clear evidence the aether doesn’t exist, several other experiments have shown time and again that relativity is right, and the aether model is wrong. As far as mainstream physics is concerned, the aether has been dead for a century. Despite this seemingly strong evidence, there are still a few fans of aether models. Many argue that these experiments don’t entirely disprove the aether. Perhaps the Earth drags the aether along with it somehow, or perhaps Earth really doesn’t move. In support of the aether they will often hold up an experiment known as the Sagnac effect. The experiment was first performed by Georges Sagnac in 1913. At the time it was a challenging experiment, with lasers and modern equipment it’s pretty easily done. The basic idea is to take a beam of light and split it so that half the light goes around a path clockwise, and the other half counterclockwise. The two light beams are then combined so that they create an interference pattern. Any shift in the speed of light will then cause a shift in the interference pattern. This is similar to the method Michelson and Morley used. The big difference is that you take the entire apparatus and spin it. If there really is an aether, then the device must be rotating through it, so there should be an observed shift in the interference pattern. Sure enough, when Sagnac performed this experiment he observed a shift. This experiment has been done countless times in a variety of ways, and the shift is consistently observed. The Sagnac effect is very real. Sagnac thought this experiment confirmed the existence of the aether, and he’s partly right. A shift in the interference pattern is exactly what the aether model predicts. Sagnac also thought the experiment disproved relativity, and that’s where he’s wrong. A shift in the pattern is also predicted by special relativity, as Max von Laue predicted two years before Sagnac performed his experiment. 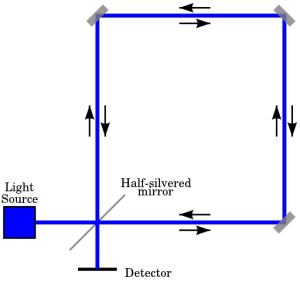 Nonrotating (left) vs rotating (right) Sagnac interferometers. What Sagnac failed to understand is that special relativity applies to frames of reference that are not rotating, so it doesn’t predict that light’s trip around the loop is the same in both directions when the device is rotating. If you were to look at the rotating device from above, you’d see that light that travels in the direction of the rotation actually travels a longer distance because the device is rotating away from it a bit. The light going in the opposite direction makes a shorter trip, since the device rotates into it. So relativity also predicts a shift in the interference pattern. As a result, the Sagnac experiment is inconclusive, since it agrees with both the aether and relativity models. This happens sometimes, and when it does you need a tie-breaker to distinguish one model from another. In this case there are several such experiments, but one very clear one comes from Einstein’s most famous prediction, E = mc2. If relativity is right, then mass and energy must be connected. If Einstein equation fails, then relativity is decidedly wrong. Of course if that were the case, things like nuclear power wouldn’t work, but since lots of people rely upon nuclear power every day, we can declare relativity the winner. So the only place you’re likely to find aether these days is in one of those Marvel superhero movies. Maybe there is still some “Aether” which is called “CMB”? Where it is possible to show the movement of our Earth/Sun/Galaxy relative to it. I have the picture of the Planck mission in mind. So it looks like an “absolute frame” of the Universe. Is this correct? Excuse me but what exactly is the medium upon which electromagnetic energy and photons travel ? These questions can still not be sufficiently answered and until the true nature of the time-space fabric is really known (because if it was ‘nothing’ then there would be no way for particles or waves to move). Until it is solved eerything else is purely philosopical speculation. Even what gravity is is not really understood so to say an ‘aether’ isn’t there is about as valid as saying ‘gravity is there’ even though we know how it affects things etc. but not really what it is made of or how it causes attraction between masses. Hmmm…it doesn’t strike you as being even the slightest bit odd that the very physics geniuses that are convinced that the aether doesn’t exist are the same ones that are now convinced that an equally mysterious and ‘ethereal’ substance does? Doesn’t it strike you as odd that the folks who ignore the evidence invalidating the aether also ignore evidence supporting dark matter and dark energy? Todd: Let’s see the math behind your claims about the airplane, etc.. Otherwise you’re just spewing nonsense. Just because you don’t understand something, or it seems unbelievable to you, that doesn’t make it wrong. How about a train ride and throwing up a ball perpendicular to the ground while the train is in full motion and watching the ball falling straight down instead of flying towards the rear end of the train? How about realizing that the atmosphere is moving along with the earth? Can you please named at least one single valid experiment (that does implicate the theory of relativity) proving the existence of dark matter and dark energy? There are lots. You can start with this series of posts explaining it all. If you read M & M’s actual paper, they do not discount the existence of aether, and they in fact suggest that more experimentation is needed, as their experiment happened once in one place and only proved that, if aether exists, there’s far less of it low down on earth than was predicted – there was a shift, but a minute one. Einstein himself was still a believer in the idea. I don’t understand how and why ‘theory’ is considered more proof than ‘practical’. Also, why are we not trying these experiments in the ‘vacuum’ of space for a more ‘accurate’ measure? After all, the aether is not meant to be abundant on earth but up there…? Arguing that “more experimentation is needed” is pretty standard in scientific papers, particular one where the result is so unexpected. What M & M did admit was that there is a way to hold on to the aether, but not in the way that was generally accepted. More experiments were done, and they confirmed the nonexistence of the aether. Keep in mind we’ve now done these kinds of experiments for more than a century. Theory has been strongly confirmed by experiment. You are right on track. Hidden from us is the findings in a 1986 Recreation of the M&M experiment. It was overseen by the US Air Force and the article can be found in Nature Magazine August volume 322. Nature Magazine August volume 322, well now that sounds impressive. Shame if someone were to track down that article. Thanks for the post idea. You’ll see it soon. Teaser: next time check sources before you cite them as evidence. Nicolas Tesla já sabia sobre o éter e qual força atua sobre o mesmo, O eletromagnetismo, por que a mentira deve prevalecer : por causa do Einstein ? A relatividade é uma enganação, a mediocridade de rever os conceitos sobre energia é hilária.O homem poderia surfar no éter com o uso do eletromagnetismo, Alias, a terra é plana, isso incomoda muita gente. Unfortunately for the author the E=mc^2 formula was derived prior to Einstein’s work by a purely electrical derivation. This means electrostatic forces can account for E=mc^2 with no need for special relativity. And explaining Sagnac’s results away by saying it is a rotating system means that the exact same effect should have been detected in the Michelson Morley 1887 test also since they assumed the earth is in a rotational path around the sun. Or will you say once the circle gets big enough its no longer a rotational frame of reference? Propping up failed theories is the proof of the stagnation of mainstream science. Formally, special relativity applies to an inertial frame, which is a good approximation for Michelson-Morley, and not for Sagnac. So your argument doesn’t apply. While there were various ideas that tried to equate mass and energy in terms of things like magnetic fields, these were classical in nature (such as Hasenöhrl’s work). As we now know with quantum theory, some of Hasenöhrl’s assumptions don’t apply. Einstein’s theory does, and has been rigorously verified. So again, your claim fails. 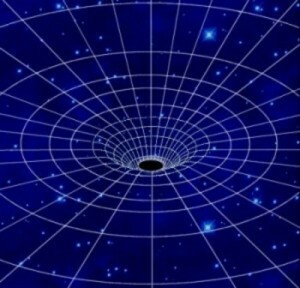 The general and special theory of relativity are simply that, theories. Einstein, came up with his theory as a way to answer away the Michelson and Morley experiment. He lied in one interview when he was asked if he knew about the experiment prior to his theory of relativity eventhough a letter that was found after his death from him to his fiance indicated otherwise. Also, during his speech at a university in Japan he even admitted that he knew about the Michelson and Morley experiment before his theory. The scientific community would never allow their heliocentic model to fall to pieces by this, and other experiments, as it would mean simply that the earth is stationary and does not move. If a theory cannot be observed practically it has no place in the scientific community. It should be thrown out. Not quite sure what you’re on about. Relativity has been rigorously confirmed by numerous experiments. First thing that should be thrown out is your smartphone (assuming you’ve got one). It has a GPS chip that calculates your position by receiving signal from GPS satellites. Each satellite has an onboard clock, and these clocks’ speed is adjusted for both general and special relativity effects. But for this adjustment, your GPS would drift by approximately a kilometer a day. Has the Michelson-Morley experiment been conducted in space, far away from earth? I did some research about it and all I found were physicists talking about why Nasa has not done it yet and should have done it yet. I remember a paper from Einstein where he said that finally, space-time is a variant of the aether except it is not universally immobile (just locally). Thanks in advance for the eventual answer. Brian Koberlein; Could we, for a moment, throw away all these gibberish. Do you have an actual picture of “your universe” that isn’t composite or computer generated? “Do you have an actual picture…” That right there is your biggest misconception about science. Most of what we learn is not from pictures. It’s data. Gathered from optical and radio telescopes, gravitational wave detectors, clock measurements, etc. We make composite pictures in the hopes that people like you, who will never take the time to look at piles of actual data, will understand what we’ve discovered. But it’s through data that we actually learn things. If you’d like to take the time, much of the data is freely available. It’s already there waiting for you. As if You were able to distinguish between proof and fiction. You’ve already proven your total lack of understanding when it comes to science and epistemology. Is it human ego or something else, that we keep concluding that scientific theories are proven conclusively time and again? How many times has this happened in history? For centuries, it was “concluded” that the Earth is in the center of the universe. It was then “concluded” that the sun is in the center and the planets revolved around it. Then it was “concluded” that the sun and the planets revolve around the center of the galaxy, which is one among innumerable galaxies in a supposedly infinite universe. Now we seem to be moving towards concluding that there are multiple parallel universes. Aren’t we like ticks on the back of the elephant, or the bacteria inside, cocksure that that know how the world works, from their limited vantage point. The displayed by the scientific community across the ages is amazing! Forget humans, Earth is not even the size of a pin head in comparison with Milky Way Galaxy, leave alone the universe. From such a ultra-microscopic vantage point, we have determined how the universe works conclusively? I am not sure we have learnt all about Earth, or the solar system, leave alone the galaxy or universe. So give me a break, as you all sound like loons in a cult. Which scientist have claimed that “we have determined how the universe works conclusively”? The only claim I have ever heard of from scientists concerning the currently accepted theories is that after many many different experiments all around the globe they haven’t been falsified, and are therefore considered valid and acceptable. If you are an observer in the middle of the interferometer, what is happening? Are the distances to the mirrors pulsating when the plate is rotating? If you imagine space or the aether being created inside of matter, you can imagine it being created compressed since space already exists. Now imagine that space becomes less compressed or expands as it leaves matter. Compressed space means that more places exist in and around matter for quarks and photons to move toward. That becomes a basis for the attraction of gravity. Compressed space also requires that things take a longer interval of time to move a specified distance thus you have time dilation within gravity. Take space now as it decompresses while moving outward toward the outer edges of galaxies, it becomes somewhat repulsive to matter and supplies the necessary force to keep the galaxy in formation. That is the basis for dark matter. Space continues to move and decompress into the voids between galaxies and now you can imagine the reason for dark energy. The trouble with the Michelson-Morley experiment is that they expected to find a flow of space as the Earth moved through the fixed aether instead they should have looked for a flow from the Earth. In the moment immediately after the Big Bang why did some particles ‘ Slow down and crate Mass while others continue at the created speed?